Ezra was a Jewish exile who came from Babylon to help with the restoration of Jerusalem following the Babylonian exile. According to Nehemiah 8, when Ezra arrived he learned that the people were not living according to God’s laws, so he arranged for the people to hear the law taught and explained. This led to a revival of commitment among the people. 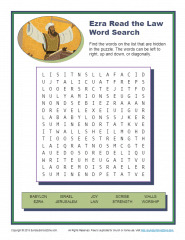 This free word search activity shows Ezra reading the law to the people and can help children learn the value of reading and studying God’s Word, the Bible.